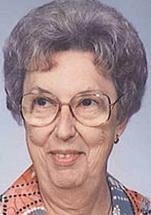 WATERLOO - Harriett Boike, 89, of Waterloo, died Monday, Aug. 30 at Allen Hospital of natural causes. She was born July 23, 1921, near Dike, daughter of Harm and Emma Saathoff Boike. She worked at Rath Packing Co. in Waterloo for 36 years, retiring in 1983. Survived by: a son, Darrell (Laura Bohlen) Boike of Waverly; two granddaughters, Erin (Chad Bolin) Boike of Cedar Falls and Jill (Cameron) Crosser of Eldora; two great-grandchildren, Brayden Crosser and Madik Bolin; her special friend, Hartley Latterman of Waterloo; a brother, Leslie Boike; and a sister, Minnie Ruthenberg, both of Cedar Falls. Preceded in death by: a brother, Herman Boike; and a sister, Mabel Henningsen. Private inurnment: at Elmwood Cemetery, Dike, at a later date. Dahl-Van Hove-Schoof Funeral Home is in charge of arrangements. Memorials: may be directed to Darrell Boike, 109 Iowa Ct., Waverly 50677.